Viktor Pendrake is one of the most-beloved characters in Hordes. The adventuring scholar has been known to players of that universe ever since the first Monstronomicon. He went all around the world, cataloging all the strange and wonderful (and often extremely dangerous) creatures that inhabited the world. Like Privateer Press' version of Sir David Attenborough, if Sir Attenborough hacked things to pieces with a big sword from time to time. Well, a character like that would certainly attract interesting students. It's two of them we get a look at today. Granted, Viktor is getting up there in years, and can't be everywhere at once. 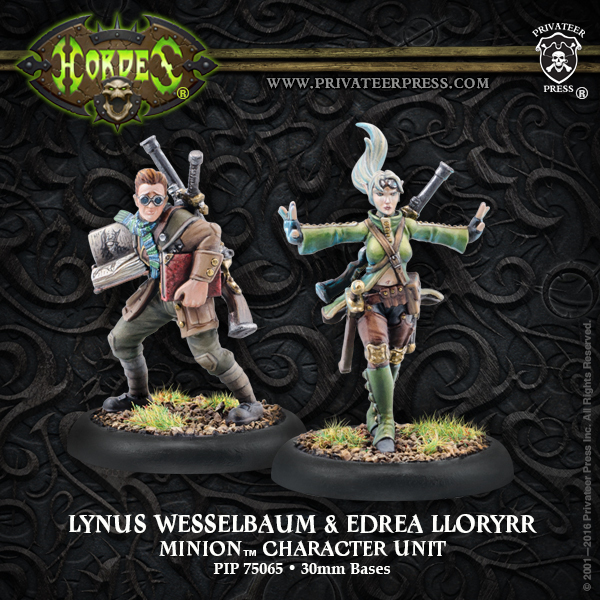 So that's where Lynus Weselbaum and Edrea Lloryrr come in. They've taken it upon themselves to pick up where he's left off. And hey, it's a unit for Hordes where the fluff isn't, "They kill things all the time. It's just what they do. Killing, killing, killing. It's how they spend their day, hip-deep in the gore of their enemies." So that's good.